In 2016, the founders of Every Day Optimal travelled to Colorado with a mission to find forward-thinking farmers interested in growing high-CBD strains of cannabis. From that day on, their goal in moving forward and becoming a part of the CBD industry was simple. They just want to help as many people as possible. At CBD School we’re constantly testing the newest CBD products that hit the market to gauge if they truly stand up to the competition. Our reviews are intended to offer you a real-life take on exactly how these CBD products stand up. Without further ado, here’s what we think of Every Day Optimal CBD. In the competitive market that CBD really is, it’s vital that manufacturers create a product consumers will love. The brains behind Every Day Optimal CBD understood this when producing their products, which is one of the biggest reasons they chose to use organically-grown hemp cultivated sustainably to create their line of CBD products. To create high-quality CBD, you’ve got to start with high-quality hemp, which is exactly what they’ve done. Something else Every Day Optimal understands? That there are a lot of legitimate CBD companies out there, and in order to keep up with this competition that their products have to be the best they can be. All of their products are produced with this in mind, then third-party tested for accuracy, consistency, and transparency. They’ve made it a priority to use the highest-quality mixing agents as possible, blending their products with pure grapeseed oil and MCT oil to create the products they proudly stand behind. Click here to see the third-party test results for the whole Every Day Optimal product line. At the time of writing, all of the lab results shown had already expired. That’s something we really did not like. It’s important for brands to do up-to-date testing and constantly post current results for you to see. Hopefully Every Day Optimal will be adding updated lab results soon. When Every Day Optimal debuted their products earlier this year, they made sure they had all their bases covered. They’ve got a variety of CBD tinctures, capsules, pills, gummies, edibles and more to meet the demands of a variety of individuals who might benefit from CBD. 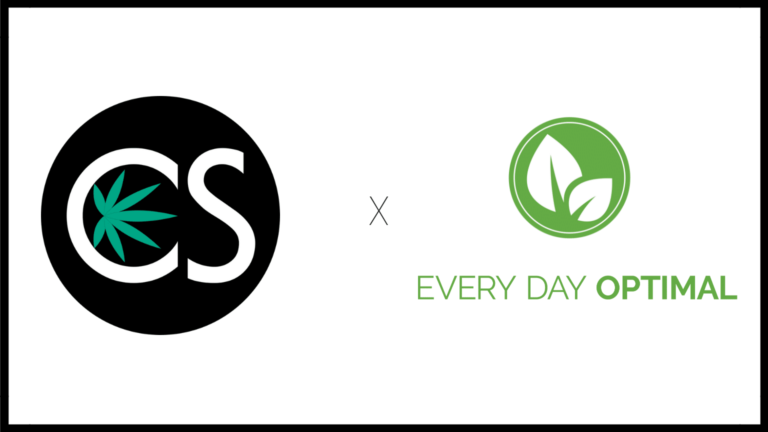 According to their website, Every Day Optimal “manufactures some of the strongest and most potent CBD tinctures on the market.” All their tinctures are made with CBD isolate and come in options from 300mg-4,000mg. 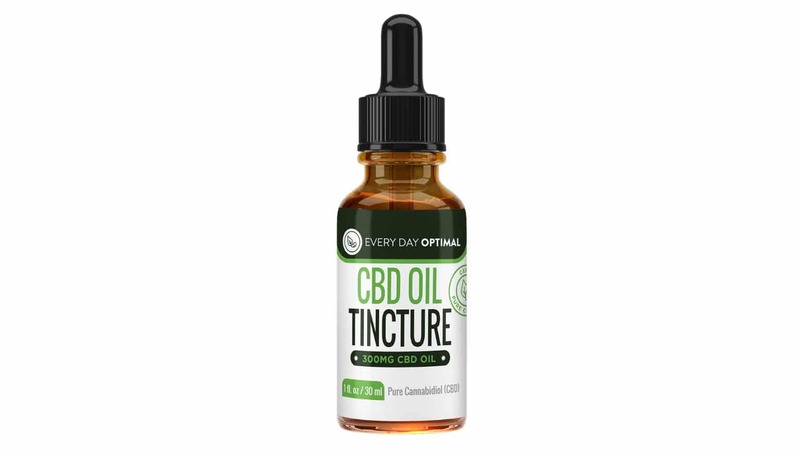 For first-time CBD users, Every Day Optimal recommends their 300mg tincture. At $39.99 a bottle it’s affordable and an easy way to see if CBD might be right for you. After this, their CBD tinctures just get more potent. You can choose from 600, 1000, 1800, 2000, and 4000 milligram bottles depending on just how much CBD you intend to take. We tested out the 600mg bottle and found that it worked just fine for mild anxiety relief, a splitting headache, and some of our stubborn muscle aches and pains. We did, however, double the recommended serving size of a half dropper to a full dropper, which gave us 20mg CBD per serving instead of 10mg. The peppermint flavor is super mild and tastes very close to a Thin Mint Girl Scout Cookie. The only drawback we could find regarding their tinctures had to do with that mild peppermint flavor. We didn’t mind it at all, but anyone looking for a flavorless tincture won’t find it from Every Day Optimal, as all of their tinctures have added peppermint flavor. 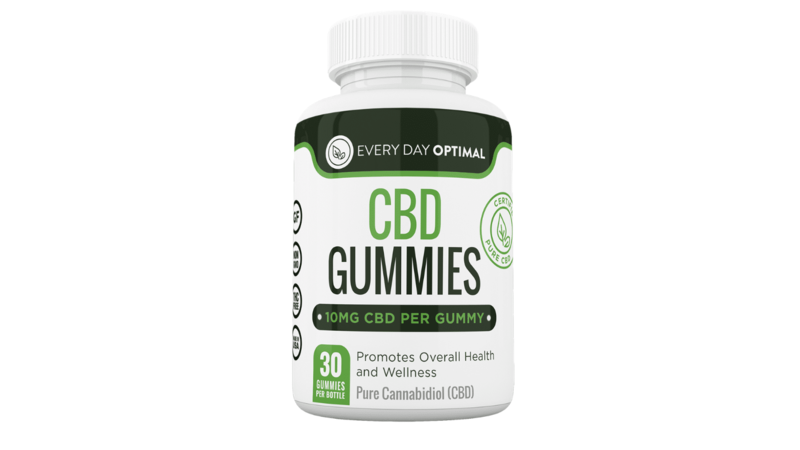 Like many other CBD companies, Every Day Optimal CBD has the option of CBD-infused gummies. They’re available in three different serving sizes: 10mg, 15mg, and 25mg. While their website says their gummies don’t contain any artificial ingredients, ingredients listed on the bottle clearly states “Natural & Artificial Flavors” as the sixth ingredient. Sugar and corn syrup are the second and third ingredients respectively. Just something to keep in mind if you’re sensitive to artificial flavors or don’t do sugar or corn syrup. They’re also made with gelatin, so if you’re a vegan they won’t not be your gummy go-to. If you don’t mind the added sugars or artificial colors and flavors, we can confidently say that these gummies do stand up to others we’ve tried. Not only do they taste great but are a super simple way to get your daily dose of CBD. They’re also an easy way to take your CBD with wherever you may go. We like to keep a bottle of gummies in the car with us for an easy and effective way to reduce any driving or traffic-related stress we might come across. 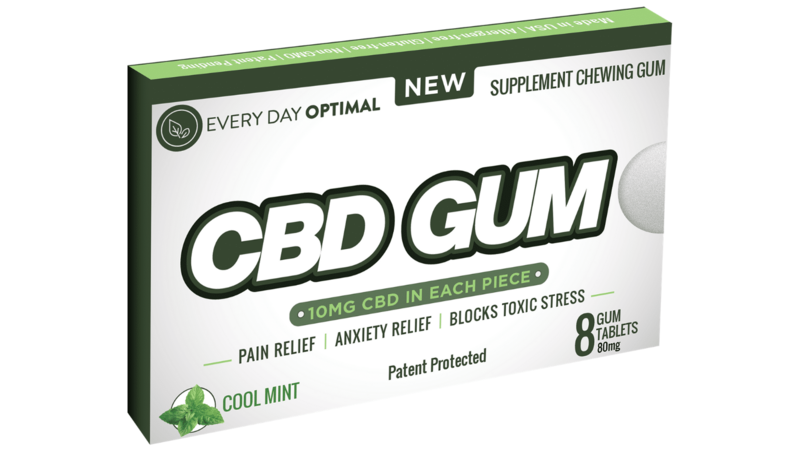 While we didn’t try Every Day Optimal CBD Gum, the option is there for those who are interested. Each piece of gum is infused with 10mg of CBD and according to their website is a “sublingual administration masterpiece.” This is because by chewing gum over a period of time, the body is given more opportunity to absorb more CBD into the bloodstream. I have been chewing one piece until the flavor is long gone each day around 2 pm. Two days in, not much difference in pain, but I started sleeping a little better. Four days, definitely sleeping better and it was easier to stand in the morning. Ten days in, I can stand up straight first thing in the morning. I am still sleeping better, I am not taking Ibuprofen (was on 1200mg plus per day). 14 days in and I am actually considering going for a run. Interested in taking your CBD like a regular supplement? Every Day Optimal has you covered. They’ve got capsules in four different strengths: 10mg, 15mg, 25mg, and 50mg. We tried the 50mg size and after only a few days felt a noticeable difference in the way we felt, especially when it came to our stress levels. One of our favorite things about CBD capsules is the simplicity they provide. It’s not like a tincture that you have to take sublingually. Just pop a capsule like you would a normal vitamin or supplement and you’re good to go. We especially like to have capsules on hand for headaches and other aches and pains we tend to experience. One 50mg capsule did wonders to ease a particularly pounding tension headache one day. 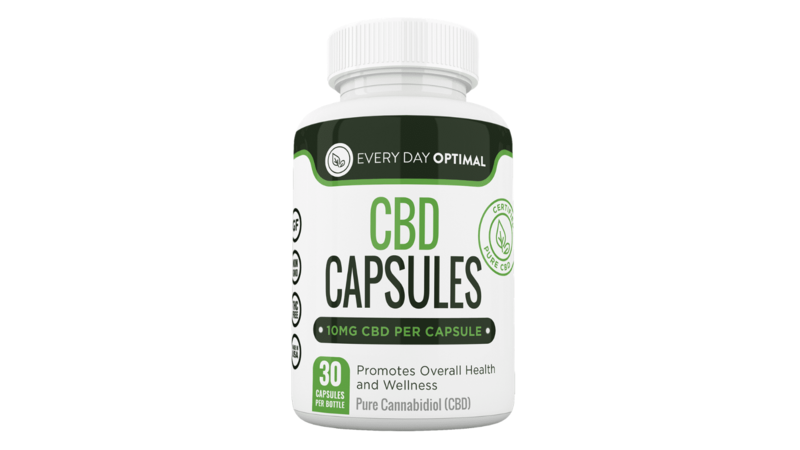 Every Day Optimal also carries “Specialty 25mg CBD Oil Capsule Formulations.” These capsules are specially formulated with CBD and other vitamins and minerals to provide relief from three specific conditions: fibromyalgia, stress, and difficulty sleeping. While we didn’t try any of these specialty formulas, the added vitamins and minerals each contain are known to be beneficial for the conditions they’re intended for. If you’re looking for quick relief, however, keep in mind that it can take 1-2 hours until you feel the effects of taking capsules. At CBD School, our pets are part of our family, and we couldn’t be more pleased with Every Day Optimal CBD oil for dogs and cats. 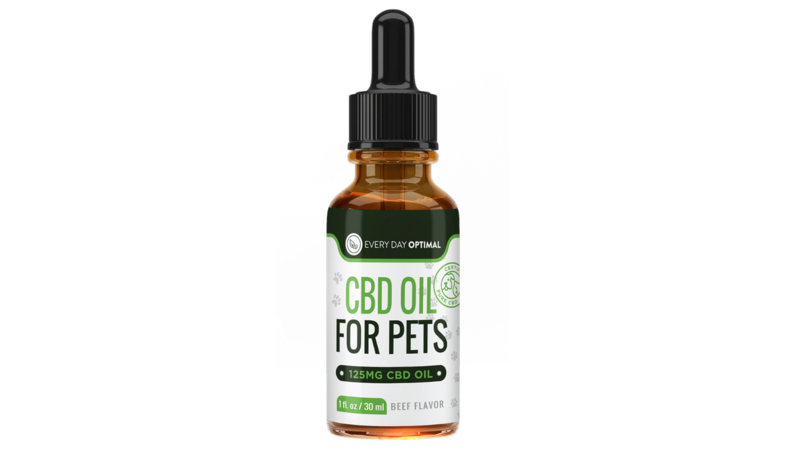 Although CBD for pets hasn’t been approved by the American Veterinary Association, with more research (that is currently underway) this could change in the near future. There is, however, plenty of anecdotal evidence out there that suggests CBD is excellent for our furry friends. In fact, our dog recently had ACL surgery and the surgeons recommended giving her CBD after she was finished with her regular meds. We’ve noticed a huge difference in her and were thrilled to try Every Day Optimal CBD for Pets. She seemed to love the beef flavor, and although she can’t tell us directly, we’re pretty sure it’s helping ease her pain as she builds back the strength in her leg. Vaping CBD is known to have the quickest effects and has been making headlines with its potential to help people quit smoking cigarettes. 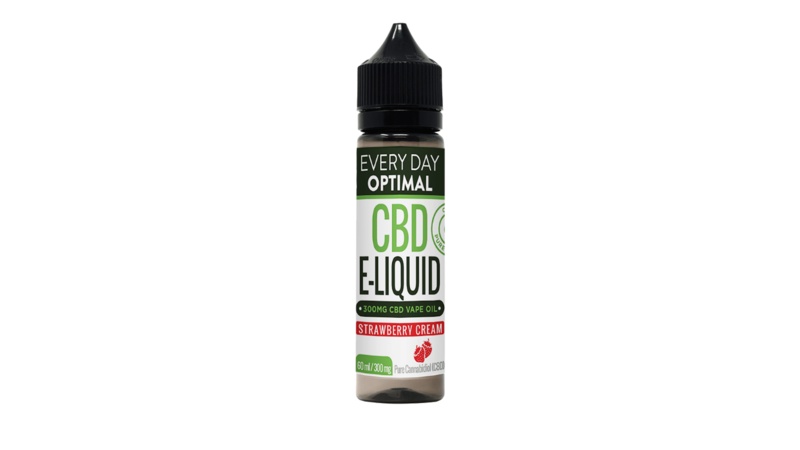 We didn’t personally test out Every Day Optimal CBD E-Liquids, but they do carry a line of two different strengths (300mg and 1000mg) in three different flavors (strawberry cream, honey melon kush, and marshmallow magic). While they don’t sell vape pens themselves, all of their E-liquids can be added to any compatible vape pen available on the market. Overall, we’re pleased with Every Day Optimal. We didn’t try everything they produce, but we did try most of it. And what we did try we found to be comparable to other reputable companies in the industry. They’ve got a good selection of products and their milligram choices can’t be beat. Anyone who might need to take an extra-strength formulation of CBD will have no trouble finding it with Every Day Optimal CBD. One thing we really liked was how much information Every Day Optimal offers on their website. On each page of products that they carry, Every Day Optimal provides a wealth of knowledge on how that particular product might be of benefit. They source out various studies that have shown CBD to be effective and also offer guidance on how many milligrams to take for various conditions. All products are made with organically-grown hemp that is extracted to its isolated state, meaning there aren’t any trace amounts of THC in their products, which is great for people who can’t tolerate THC or might need to pass a drug test for any number of reasons. 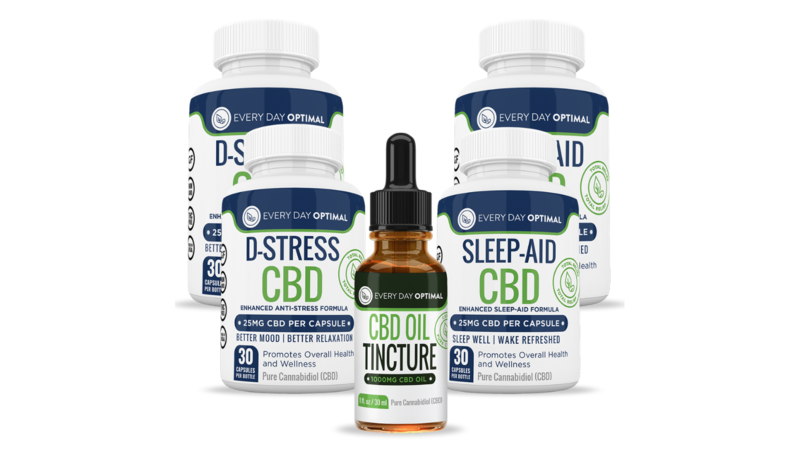 Every Day Optimal CBD also offers four different packages of “money-saving bundles” that can save you up to 28% off. Their CBD Value Packs are all different and are put together with a specific purpose in mind. Their “After Work” bundle, for example, is meant to offer everything you need to de-stress after a long day’s work and help you get the sleep you need. We found Every Day Optimal to be a legit company that’s doing their best to set out what they intended before they began: to help as many people as possible. Click here to try Every Day Optimal CBD for yourself today!